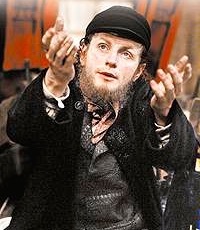 The good news about Stratford's current production of "Fiddler on the Roof" is that Brent Carver is absolutely wonderful in the main role of Tevye the dairyman. The naturalness and simplicity he brings to the role banish all thought of previous, more famous portrayers of the character. Compared to Carver, their portrayals seem overly sentimental, clownish and too given to shtick. Carver's voice is beautiful rather than gruff and hearty. His slight physique better suits a man living in poverty. And his complete lack of pretence make his frequent addresses to God seem sincere rather than arch. After seeing Carver, I wouldn't want to see anyone else in the role. We really feel his struggle as he tries to justify to himself the increasingly less beneficial matches his three oldest daughters choose for themselves. Unfortunately, director Susan H. Schulman surrounds Carver's subtle, re-imagined Tevye, with a cast of caricatures. Worst among these is Theresa Tova as Yente the matchmaker. She speaks several decibels louder than anyone else and her acting is so over-the-top it is obnoxious rather than comic. Her accent suggests she hails from Count Dracula's Transylvania instead of the Ukraine of Anatevka. Barbara Barsky, as Tevye's wife, could have followed Carver's lead by giving her character nuance and depth, but instead she allows Golde to be another stereotyped Jewish mother. Luckily, the roles of Tevye's three principal daughters are all well played and well sung--Robin Hutton as the eldest Tzeitel, Tracy Michaildis as Hodel and Amy Walsh as Chava. Michael Therriault turns in another fine performance as comically shy tailor, Motel, who finally works up enough courage to ask for Tzeitel's hand. The same cannot be said for the other two suitors. Fred Love as the student in love with Hodel, acts more as if he comes from Kansas than Kiev, making no attempt to match the Yiddish-influenced speech rhythms of those around him. He is such a cold fish it's impossible to see why Hodel falls for him. Jonathan Goad as Fyedka, the Russian in love with Chava, has the same flaws as Love though at least he is less stiff on stage. George Masswohl as Lazar the butcher is very fine in showing both pleasure at the prospect of marrying again and, later, anger at his disappointment. Craig Ashton does very well in making us believe the constable feels the dilemma of "only following orders" in disrupting Tzeitel's wedding and later in evicting the whole Jewish population of Anatevka from their homes. The bad news about "Fiddler" is that nothing else cuts through the potential kitsch of the musical in the way that Carver redefines its central character. The worst offenders are New York-based director Susan H. Schulman and Canadian designer Debra Hanson. In contrast to Carver's winning simplicity, the show as a whole is shamelessly over-produced, as was this duo's production of "Man of La Mancha" for Stratford in 1998. Schulman clearly has no respect for Tanya Moiseiwitsch's basic design for the Festival Theatre stage. In 1998 and again now, she removes the balcony and staircases from the stage and then ensures that every inch of the original wood is covered over with a set. No other director at Stratford has made such an effort to obliterate the beauty of that famous stage. In effect, she is attempting to turn the multivalent possibilities of Moiseiwitsch's elegant design into the back wall of a proscenium stage with the thrust as the reduced performing area. Moiseiwitsch's basic stage could, without adornment, have easily served as the prison setting in "La Mancha" and as the shtetl in "Fiddler". But for the New Yorker and the Stratford administration that sanctions her actions, this simplicity must be thought lacking in "production values". Besides, hiding all evidence of the basic stage design, Schulman has a penchant for demanding the installation of expensive mechanical toys. In "La Mancha" she pointlessly had a mechanized drawbridge put in to link the stage to the balcony (when the original staircases would have done just as well). In "Fiddler" she has had a double revolve put in, seemingly oblivious to the fact that the shows at Stratford play in repertory so that this huge (unnecessary) machine will have to be dismantled and reassembled for every performance. In both shows, Schulman does not make enough effective use of the mechanical toy to justify its installation. Unlike in "Les Misérables", where a revolve was in constant use to feed in and unload props from the stage, here, props are carried on and off as if the revolve were not there. Only in the wedding of Tzeitel and Motel, does she use the revolve to any effect, having it turn slowly as the cast sings "Sunrise, Sunset". It's a lovely moment, but could have been achieved by simpler means and without the audible whirring of the machinery. Debra Hanson again indulges her inclination to glamorize whatever play she tackles, whether it is appropriate or not. Her extravagance made nonsense of the prison setting of "La Mancha" and here she annoyingly cutesifies the world of "Fiddler". Taking her cue from Boris Aronson's original designs, Hanson has painted the revolve with various motifs from Chagall and hangs chairs, a rooster and a menorah from the ceiling. Her "back wall" depicting the shtetl, however, owes far more to Disney cartoons than Chagall. For five daughters living in poverty, Hanson clothes them as tidily as if they were in "Anne of Green Gables". Her refusal to break down the costumes is bizarre considering the poverty the characters are said to suffer. Only two tiny patches on Tevye's coat suggest that it isn't brand new. In the dream sequence in Act 1, she elaborately and quite inappropriately clothes the ghosts as if they were exiles from a Desmond Heeley production of "Oedipus". New Yorker Michael Lichtefeld's choreography is spectacular in recreating Jerome Robbins's original choreography, as in the famous "bottle dance", and in otherwise adapting it to a thrust stage. Kevin Fraser's lighting, unusually for him, frequently calls attention to itself in its abrupt shifts and its look-at-me prettiness, but in so doing it fits in with the graceless overall design concept of Schulman and Hanson. Musically, Jerry Bock and Sheldon Harnick's songs are very well performed. The most effective scenes are all the simplest ones, especially those between father and daughter. Still, Brent Carver is the overriding reason to see this classic musical. The naturalness of his performance ultimately dominates even the crassness of the production. Yet, imagine how powerful the show might have been if the moving simplicity Carver gives his character could somehow have informed the whole production. Photo: Brent Carver as Tevye. ©2000 Stratford Festival.